After an early morning recon ride in the car with Mrs. Rootchopper, I went back on my bike to take some pictures of the local fall foliage. Fort Hunt Park has several maples that put on a show for about a week every autumn. And with the river, the foliage, and the angled sunlight, the Mount Vernon trail is simply beautiful. In my defense, it is that time of year when the low humidity and cool temperatures make for perfect sleeping. In the aftermath of the bike tour and with my rib still healing, my body just wants rest. So I am feeding the beast. Today, after waiting for the temperature to rise, I rode the Cross Check to the Lincoln Memorial. Just because. And it was super nice out. And the trees are turning. Like this one across the river from the Memorial. On the way home I pulled over to record another odometer milestone. I’ll put the Cross Check away for a few weeks and give my other bikes some attention. Once I got home, I mowed the lawn. Mowing the lawn feels like you are accomplishing something even when you really aren’t. Then I went inside and did something I’ve been meaning to do since I got home. During my bike tour to Key West, hurricane Maria made landfall on the Virgin Islands and Puerto Rico. Two of my BikeDC friends (who, incidentally, don’t know each other) are from Puerto Rico. They each spent many anxious days not knowing the fate of their families. (From what I can tell, all are accounted for and out of immediate danger.) A week or so later, I started riding in southern Florida. Even a month after hurricane Irma made landfall in the Keys, the devastation was obvious. I simply cannot imagine what the Virgin Islands and Puerto Rico are like. So today I made a donation to the American Red Cross. You can too. Here’s the site. Did you ever notice that a random thing brings a particular person to mind? I’m not talking about physical or personality traits. We all associate certain hair colors or hair styles, a laugh, or a mannerism with particular people. Lately though I’ve noticed that I associate certain meaningless random things with particular people in my life. Dark gym shorts with white trim. These associations only really come to mind when I have the object in view. Is there a word for these sorts of things? During my recent ramble to Key West, I spent nearly a week dealing with a tropical depression. This was a storm off the east coast of Florida that cranked rain and wind at me. The wind was coming from the east and northeast. It carried with it fine grains of sand. By the time I got to Key West, my 24-speed bike would not shift into the big ring, making it a 16-speed. I managed to make it home without difficulty. At the first opportunity I took the bike to a local bike shop. They worked on it and told me it was ready. Not even close. It shifted into the big ring on the work stand but not on the road. And the shifters required real elbow grease to actuate. So I gave it back to them. While I was there they made three different adjustments to the shifting. None worked. In fact, the last adjustment made the chain rub on the derailer when I shifted into the (lowest) granny gear. They told me they’d work on it some more. Having already paid for the repair, I am not surprised that they showed little urgency in getting to it. I called on Sunday. “It’s in the workstand.” I told them I’d call on Monday. It wasn’t ready. So I called today. It still wasn’t ready. In the half hour it took me to drive there, they managed to get the darned thing working. They sprayed the shifters and cables with lube, essentially flushing out the sand that the depression had injected into the works. It’s not perfect but it’s greatly improved. Once winter does its thing, I’ll probably start fresh with new shifters and cables and housings. With my bike and my ribs (thankfully) nearly healed, I am back to normal. I am trying not to eat too much junk. I like the fact that my clothes grew while I was away. I’be neen doing some day rides. And then there is the planning for next year’s tour. My current thinking is to ride to the Pacific Northwest. There are so many other places in the U.S. I’d like to ride. The Natchez Trace. Route 66. Skyline Drive and the Blue Ridge Parkway. The Katy Trail. The National Parks of Utah. Yosemite and Sequoia National Parks. Bar Harbor. If you connect these dots you get a 10,000 mile bike tour. Hmmm…..
And on a final note, the Southernmost Point buoy that was damaged by hurricane Irma is back in shape. DC has gone racing crazy. Today was the annual Marine Corps Marathon. (The one that I never finished. Sad face.) I rode ten miles to Crystal City to cheer my friend Heather on. The crowd was really loud. There was music and a sort of festival going on across the street. I am always surprised how some people with horrible running form run right along side people who run smooth and fast. Heather was shooting for 4:10 so I staked out a spot near the 23 mile mark and waited. And waited. I did a lot of clapping and cheering. As did the people around me. One woman brought a big plastic container of donut holes. The elite runners weren’t interested but the slow pokes went all in. I never saw Heather. I later learned that she finished in 4:33. She encountered cramps at 25 miles. She also found beer during the last few miles. Drinking beer after running used to make my entire body feel awful. I don’t know how anybody drinks it while running. After I gave up (when the 5:00 pace runner went by) I rode to the grounds of the Old Soldiers Home in DC (which I’d never seen before) to see DC Cyclocross. Many of my friends, male and female, young and old (and foolish), love this stuff. They love to race and to hang out and be bikey. I have to admit it’s pretty cool to watch. It’s like watching a bicycle roller coaster. Friend of the blog Brian rode for the first time today. I missed it. Apparently he thought it was awesome. He will be insufferable now. Wait, he’s always been insufferable. We’re doomed. Did I mention the weather was perfect? For the fourth day in a row. We get another one tomorrow. Then it rains. And cold-ish air comes in. Good thing I’ve got my 1,000 miles for the month in. It only has 30 days but September 2017 was the longest month of my bicycling life. I rode 1,742 miles, over 58 miles a day. Eek! Actually, I took two days off so I averaged over 62 miles on the days I rode. Yikes! The first two-thirds of my No Way So Hey bike tour accounted for 1,413.5 miles. 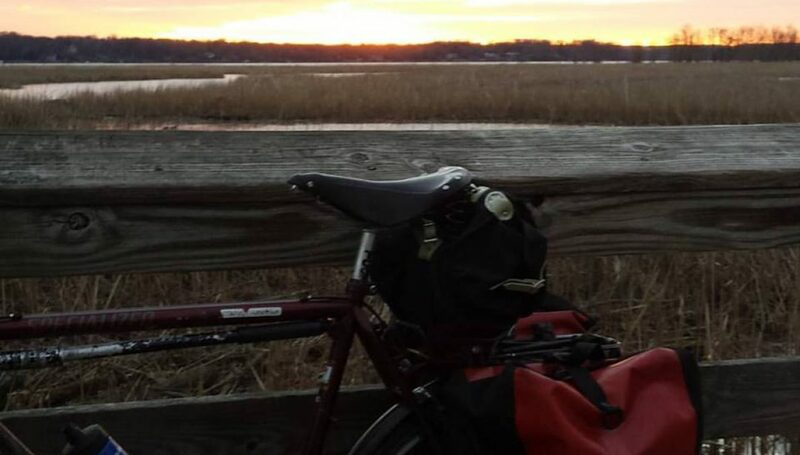 I rode two centuries (103 and 99.5 miles – rounding up) plus two other days of over 90 miles. On top of the tour, I did the 50 States Ride for the ninth time. I had a great time except on the last hill that nearly killed me. It was so hard that I had big doubts about my ability to even do the bike tour. Fortunately, after the first day, hills were few and far between. I did a smattering of other day rides during the month. Little Nellie, my Bike Friday New World Tourist took the month off. By the end of the month I had ridden 7,478 miles so far this year. The Mule passed two milestones: 44,000 and 45,000 miles. It is currently at Papillon Bicycles in Arlington getting some serious TLC. It has to be in shape for next summer’s follow up. The basic plan is: point the bike west and ride until you see nothing but salt water to the horizon. October is also starting to look like a 1,000 mile month. With the bike tour over, I seem to have zero energy. I sleep late. I don’t know what to do from day to day. So each day I assign a task or two to myself. Sometimes the task is “Go for a bike ride.” Others it’s do this errand or that. Today didn’t start well. I intended to get up before dawn, ride into the city, and attend a coffee get together with the folks from WABA (the Washington Area Bicyclists Association). One look at the numbers 5:38 on my bedside clock and I turned the alarm off and went back to sleep. Once I reached some semblance of consciousness, I did three errands by bike. First, I rode to the hardware store to drop off a lawn mower blade to be sharpened. Pro tip: do not crash when carrying a 23 inch metal blade, even a dull one. I made it with all my appendages intact. Next, I rode to a store in Alexandria to pick up a battery for my point and shoot camera. Yeah, I still have one. It’s for those times when I’m riding and don’t want to fiddle with my phone. I took it on tour. The battery was already suspect. It died after one day. The camera found its way to the bottom of one of my panniers for the duration of the ride. There is good news in this. My upper left arm survived almost the entire tour without pain. After last year’s romp in Michigan and Wisconsin, my left arm ached for days. I was taking pictures with my right hand which meant that I had to control the heavily loaded Mule with my left arm. It just wore my arm out. On the way back from picking up the battery, I stopped in the left turn lane at a red light. The old lady in the Kia Soul next to me rolled down her window and said, “Wanna race?” I almost fell off my bike laughing. On my way home I swung by the local rec center to buy a pass. You get to go 25 times over a two-year period for $159. Not bad. I had free access to a gym at work and never used the weight machines. Once my bruised ribs heal, I plan on going a few times a week to see if I can instill a new habit. It’s also good for skating and swimming so if weights don’t float my boat I can try out other methods of self abuse. Speaking of my ribs, they still ache when I breathe hard, go over a bump, or dismount my bike. They are getting better though. It doesn’t hurt to cough, get on my bike, or drink beer.